ENJOY YOUR BEES WITH TOTAL PROTECTION & GREAT COMFORT! 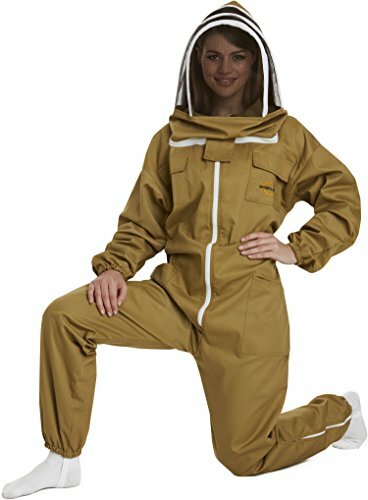 BEEKEEPERS SUIT - BEAUTIFULLY DESIGNED & SAFE PROTECTIVE CLOTHING! • Collar to Ankle 68" (174cm) • Collar to Crotch 39" (99cm) • Chest 34"- 55" (88-142cm) • Waist 34"- 55" (88-142cm) • Leg 34" 86cm) • Arm 23" 58cm) We Strongly Recommend you measure: • Shoulder/Collar to Ankle - To Determine Length of Suit Needed • Waist & Chest Diameter - To Determine Width of the Suit Needed • Collar to Crotch - For Best Fit, So Suit Doesn't Pull On Your Shoulders or Crotch • Add 1 Inch (2.5cm) to your measurements, for a comfortable suit that will give you ample room to move. View More In Beekeeping Supplies. If you have any questions about this product by Natural Apiary, contact us by completing and submitting the form below. If you are looking for a specif part number, please include it with your message.